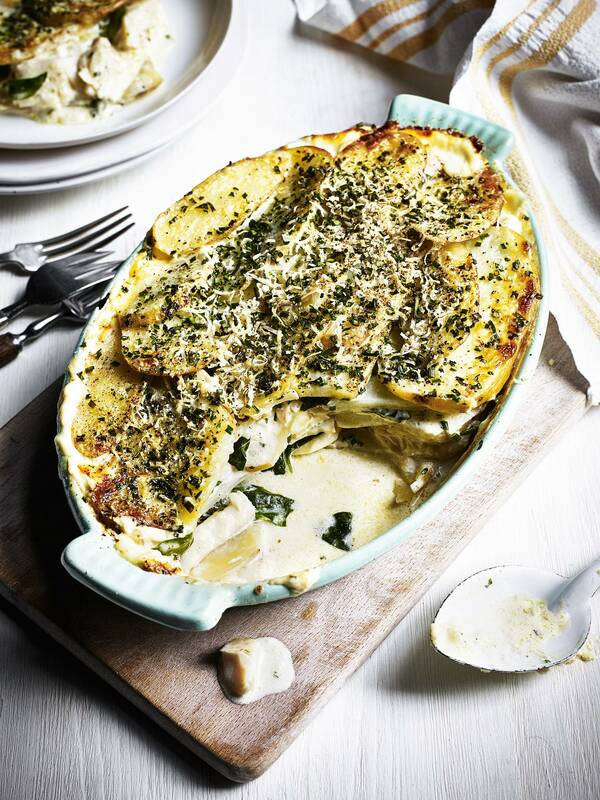 An absolutely delicious and fresh potato gratin recipe which finds a spread of potatoes topping a lovely creamy mix of haddock, spinach and chives. This tasty base transfers a delectable flavour to the blanched potatoes above. Place a large bowl of ice-cold water on the kitchen counter. Add the potatoes to a pan of water then bring the water to a boil. Reduce heat to a fast simmer, checking potatoes periodically. Cook for around 8 minutes until soft and check with a knife. Remove from heat, drain and plunge potatoes into the bowl water. Leave potatoes until cool to touch and slice. Rub the inside of a gratin dish with garlic then layer with the sliced potato then a layer of fish and spinach, season and sprinkle over a pinch of nutmeg, pepper and chives. Season each layer as you go until you reach the top of the dish, finishing with a layer of potato. Pour the cream, butter and garlic clove into a saucepan, season a little, bring to just under the boil then turn off the heat. Remove the garlic clove then pour over the gratin. Cover the top with the parmesan and chives and bake for 20 minutes until golden. This delicious recipe is perfect for using up leftover roast turkey after Christmas! Serve with a runny poached egg for an extra special touch. Rustle up this tasty Bavarian delight. Bursting with flavour and quick to create, this authentic combination of griddled pork and potato is sure to please any crowd! Enjoy a taste of India with this spiced potato and coconut curry. With a hint of sambal and delicious homemade chutney, this dish is sure please any crowd.